A garden without tools would never be much of a garden. In our 21 years of gardening at our Athlone home, Rosemary and I have spent lots of money on tools, some useful and some useless, some that didn't work, plus a small fortune on all kinds of spades whose handles I managed to break just about every year. In one case I broke the stainless steel blade. Yesterday I paid $36 (a bargain) on a spade at Lee Valley Tools that comes with a lifetime guarantee. A good spade is absolutely necessary if you transplant big hostas or move roses the way Rosemary and I do. Whenever we make a final decision on where a plant should be, it doesn't take long before we change our mind. I have had the idea of mounting wheels on some of my big hostas and then I would move them around without a problem. For years I had been eying my Hosta 'Green Fountain' noticing it was in the wrong place. This plant has longish dark green leaves that cascade down. In the hosta bed with hostas that are vase-like, that are able to compete with agressive Osmunda regalis (Royal Ferns) and large clumps of white astilbes, this potentially beautiful plant was at a disadvantage. So yesterday with my new spade I took it out of the ground and put it into a big pot. I placed the pot on a pedestal in the back of my hosta bed. Alas, Green Fountain collapsed on the spot. But this morning it was all up again and I felt happy I had purchased the new spade to replace the "very good" one I broke last week. There is one tool that I have had for many years (a birthday present from Rosemary) and I would never think of going into the garden without it in my back pocket. These are my Swiss-made secateurs. They are a top of the line model that have a revolving handle to ease the strain on the hand when one is at it all day. These clippers I use to remove the leaves that might have black spot in my roses. I use it to prune the roses and all the rest of the bushes in my garden. I use them for jobs they were not intended to perform such as removing weeds from the lawn. I plunge the secateurs into the ground and twist around the ofending weed and pull out. Some years ago I learned to use a thick leather glove in my left hand. 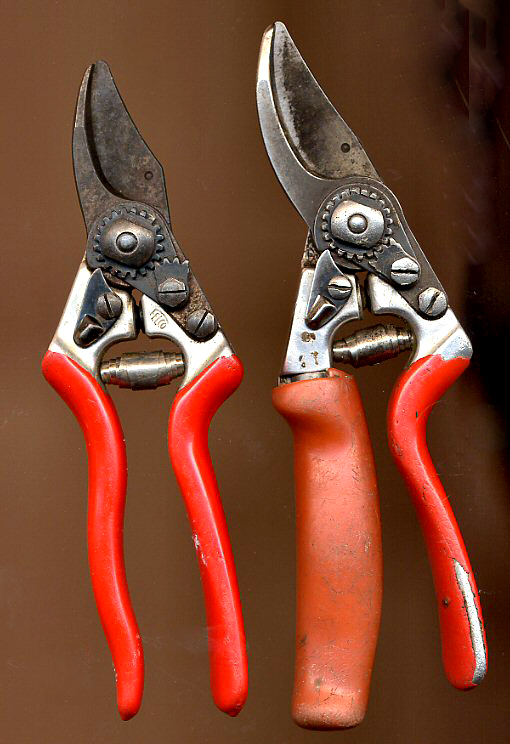 One morning I had noticed that my secateurs needed sharpening but I decided to skip the operation. I was cutting some branches (so as to then mulch them with more ease) while talking to Rosemary. I almost severed my thumb except for factors. The unsharpened blade (one important factor) met the resistance of my thumb nail. I bled a lot and learned my lesson. You see here our two Felco secateurs. Hers and mine. Hers are a bit rusty as Rosemary tends to leave them out in the rain and I have to bring them in. But she did point out a week ago when she used my pair, "Yours don't cut as well as mine do." I am so glad that is true.